PREVIEW: Will the 2017 final be repeated in 2018? Bourne's Ben Stroud is bowled during the 2017 Stamford KO Shield Final. 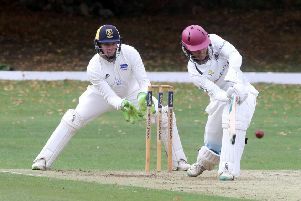 Bourne seek a quickfire Stamford Cup semi-final double over Uppingham tonight (June 25, 6pm). Bourne crushed Uppingham in the semi-final of the Stamford Charity Cup last week (June 18) and onight they travel to face the same opposition in the last four of the Stamford KO Shield. Bourne are the holders of this competition and there could be a repeat of the 2017 final in 2018 as last season’s runners-up King’s Key’s are also in semi-final action at Castor tonight. Bourne also take on Ramsey in the 2018 Jaidka Cup Final at Peterborough Town’s Bretton Gate base on Wednesday (June 27, 6pm).